The City of Angels is noticeably transforming. Our once car-centric town is becoming less car-dependent. Public transit is having a comeback. Pedestrian and bicycle infrastructures are improving. New rail lines are being built, existing ones are being extended. Service on trains is increasing. Service on buses is also increasing. …Or is it? Actually, the Rapid lines are disappearing. Hm-mm… Not everything is as euphoric as it first sounded. Let’s backtrack a moment, and look at some interesting things that have happened to our bus service. Approximately seven years ago MTA faced significant budget shortfalls, and was forced to cut service. Some of our busiest bus lines were compromised. On some routes MTA was too liberal initially, and launched Rapid service without a true need. But just on some routes. Most other bus corridors suffered heavy cuts without good reason. This includes complete elimination of Rapid buses on some lines, and significant reduction of service hours on others. Rapid line 704, running on Santa Monica Blvd., has seen some of the worst service cuts imaginable. Santa Monica Blvd is a major urban east-west corridor. Many transit-depended patrons, as well as choice riders, have utilized bus service along this route for decades. Hence MTA once ran very frequent, reliable service: Limited #304 buses at every 5-7 minutes during rush-hour. To meet growing transit demand, around year 2006 Rapid buses joined the corridor, replacing Limited #304 service. The Rapids ran every 7-9 minutes at rush-hour and every 12-15 minutes – midday. Moreover, every single Rapid connected downtown Los Angeles with downtown Santa Monica. This direct and efficient one-seat ride, between two major municipalities, received strong ridership. Good for business, good for passengers; good for Metro! Rapids outnumbered Locals #4 in ridership. 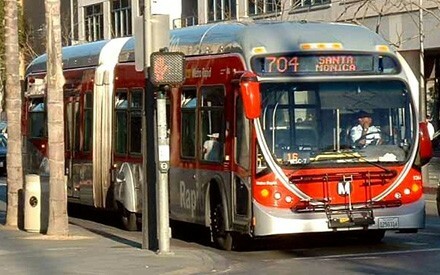 In fact, during the initial Rapid service launch on Santa Monica Blvd, 60-foot buses were erroneously assigned to Local #4, while little 40-foot NABI’s – on Rapid 704. To no surprise, MTA did things the other way around! Hence the giant 60-foot Local orange buses ran half-empty, while the small Rapids were packed like canned sardines. Luckily, during the next “service shakeup” Metro switched things around, placing 60-foot buses for Rapid service and shorter buses on Local. Both lines continued to be popular. Just when we started believing in L.A.’s mass transit, service reductions came along. Line 704 was no exception. Buses were now running at 9-12 minutes at rush-hours, and 20-minute intervals – midday. Not quite reliable, but still usable for a one-seat ride between downtown L.A. and downtown Santa Monica. Then it gets bad. “Metro Connections” program (as MTA misleadingly calls it) was formed. In reality, this is purely “Metro Disconnections”. MTA’s meaning of “Connections” is actually “Forced Transfers”. One-seat rides became forced transfers on many routes, further complicating our already complicated bus system. As a part of “Metro Disconnections”, Metro cut nearly a third of its #704 buses – to terminate at West L.A. / Sepulveda. Passengers were now stranded half-way. Midday frequencies to/from Santa Monica were reduced from 15-20 minutes to every 40 minutes. Buses became overcrowded instantly. Confusion, chaos, nuisance, and unreliability – became the attributes of this Rapid line. Obviously, ridership declined dramatically, especially among choice riders. Visiting the beach now required a very long wait for a bus, or else – a transfer on the already at-capacity Santa Monica’s Big Blue Bus. Bad for passengers, bad for Big Blue Bus; bad for Metro. For me personally, this drastic and unjustified service cut on line 704 was the last straw. Left with no other option I’m now back in my driver’s seat, polluting the air and adding to our gridlock. As a small business owner, I cannot deal with 40-minute intervals, overcrowded buses, and multiple unnecessary transfers. The situation with MTA’s budget has improved. Bus service is slowly getting back to what it once was. But Rapid 704 continues to remain a scapegoat in MTA’s eyes, despite crying-out loud from the public to improve service and despite common sense dictating to reinstate at least some of its buses. Santa Monica Blvd. transit service has not improved a bit since its draconian cuts. Today, six years later, we still see half of midday Rapids terminating at West LA / Sepulveda, stranding many riders. Semiannually adjusted bus schedules continuously show a steady decrease in the number of buses. I’ve always wondered, why oh why has Metro continuously neglected such an important bus line. Is it total incompetence and lack of common sense – to realize that 40-minute bus intervals in a large city are beyond unreliable? Or is it lack of research? Indeed, Metro officials obviously have not taken sufficient trips on this line. MTA has yet to learn that most passengers do not get off at Sepulveda (or Westwood), but continue further west. Likewise, going eastbound – only a handful of passengers boards the bus at Sepulveda (or Westwood), while the majority boards the bus way back, in Santa Monica. In fact, by the time an eastbound 704 Rapid arrives at Sepulveda, all seats are already taken; it’s standing room only! To be even more accurate, most seats already fill-up by the time an eastbound Rapid approaches Bundy Drive. By cutting half of its Rapid #704 fleet in West L.A., Metro apparently tried to emulate line 720 (Wilshire Blvd Rapid). On line 720 it does make sense to terminate selected buses in Westwood. The area around Westwood & Wilshire is a major destination: large office complexes, UCLA, including its medical facilities, and Westwood Village with a large promenade and numerous restaurants. Thus on line 720 many passengers do get on & off at Westwood. But on line 704 our situation is quite the opposite: the Santa Monica Blvd & Sepulveda stop is practically “middle of nowhere”. The only activity you can see is transferring to Culver City Bus’ line 6. Hence you only see several passengers entering/exiting the 704 Rapid at Sepulveda or Westwood. Public meetings were held regarding this line. People clearly spoke to preserve, and improve, the Rapid service. MTA clearly ignored. Ridership clearly dropped. MTA clearly lost revenue. It’s as simple as that. Ironically – and embarrassingly for MTA – even Culver City Bus (a much smaller municipal bus company) runs its fleet with much better intervals. For instance, on the low-density Washington Blvd buses run every 15 minutes all day, with 12 minutes during rush-hours. Metro, on the other hand, runs its buses every 20-40 minutes on the corridor that’s much denser, and has much higher transit demand, than on Washington Blvd. At the same time, kudos to Culver City for showing decent logic and respect to its patrons by running their buses frequently all day. Unlike MTA, Culver City does not have this ridiculous “short line” system (aka “Metro Disconnections”). All of the Culver City buses run their entire routes, all day. Perhaps MTA should take this as a good lesson, and stop stranding passengers half-way. But then it gets worse. Some of the Westside Governance Council representatives suggest to cut service even further. That’s right; if 40-minute frequencies isn’t infrequent enough, they now want to cut midday Rapid service altogether! Because – as they claim – ridership is very low. Well duh, of course ridership is low – that’s because service continues to stay inadequate, with no improvements on the horizon. Obviously, patrons will seek alternate commute methods, including driving. By the way, that same MTA official openly admits, “20-minute intervals is unreliable”, yet he himself suggests to not only keep those infrequent headways, but to cut service further. I’m not sure if this can be classified as pure inconsistency, hypocrisy, or bureaucracy. But it’s a perfect path to failure. Santa Monica Blvd was a very successful transit corridor for decades, before service cuts took place. Drop the idea of reducing service even further. Instead, improve frequencies, and ridership will most certainly increase. To summarize, I would like to address a million-dollar question: overall, has public transportation in L.A. improved over the years? On one hand – metro-rail is expanding, and train service on our subway and LRT lines is more frequent than ever. Metro-rail is open for longer hours, as well. But on the other hand, our bus service has gotten much worse, especially comparing to a decade ago. And – no, it’s not because “Rail projects are stealing all the money” – as Bus Riders Union folks claim. New rail projects are funded from a different source than our bus operations. Bus service cuts have nothing to do with metro-rail expansion. The culprit of inadequate bus service is lack of federal and state funding. But it’s also MTA’s inability to better allocate its existing funding. Hence service is reduced or eliminated where it wasn’t supposed to. For instance, a couple of years ago weekend service on Rapid line 780 was suspended due to “low ridership”. True, ridership was low – but it was because MTA placed the bus on the wrong segment! Instead of running weekend 780 Rapids between West L.A. Transit Center hub (near Fairfax & 10 Fwy) and Hollywood, MTA ran it between Hollywood and Pasadena City College, where very few people traveled on weekends. Had MTA done just a little research and logical thinking, they would learn that most weekend riders travel along the busy Fairfax Avenue, including the popular Grove. Buses #217 are packed on weekends, and they’re extremely slow. Rapids would definitely help to reduce weekend overcrowding and speed-up the commute. I still hope one day Rapid 780 weekend service will be reinstated, but this time – on the appropriate segment! Not to disrespect MTA, but their practices and decision-making oftentimes make little sense. Metro officials define low ridership on a certain route, and thus cut service further due to “low ridership”. Without realizing that low ridership is due to their own wrong decision to cut service on a busy line! Line 780, 704, 750, are only a few examples where passengers had to be disappointed with drastic cuts, despite having great ridership in the past. Getting back to our line 704. Substantial drop in ridership along Santa Monica Blvd could have been avoided, had MTA Westside/Central council done more research. High-density corridor, especially the one connecting major metropolitan regions, means high potential ridership. Which requires frequent, reliable transit service to meet high demand. Better service means more passengers. More passengers means higher farebox recovery ratio. Higher farebox recovery means more revenue for Metro. I do have hopes that Rapid line 704 service will improve, and it should happen very soon. Bus passengers need to speak up, write to MTA and perhaps to our new mayor Eric Garcetti. After all, transit service is all about satisfying the needs of customers. Our City of Angels deserves better public transportation. The problem with transfering from the 704 to line 1 is that line 1 starts at UCLA and by the time it reaches Santa Monica Blvd. all of the seats are taken and it is standing room only. In the past, I have been at Westwood where I would wait for the 704 because I can not stand for the length of time it takes to get to Santa Monica on line 1. In fairness to Metro, they face considerable political pressure from politicians (who demand geographic equity in transit service, meaning that implementation of Rapids must be spread around even if it doesn’t make sense for that route) and from people like the BRU (which bizarrely believes that Rapids are useless to transit dependent riders). It is all true. 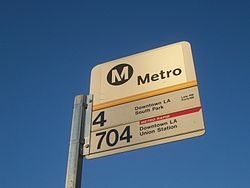 Because the 704 is so bad, if I need to go somewhere on Santa Monica Blvd, I always take the 720 on Wilshire for the east/west bus and then transfer to a north/south bus. It is almost always faster than waiting for the 704 in West L.A.
I’m no fan of the BRU. They are divisive in a way that doesn’t create success for their constituents. But in this case, they were prescient in predicting this would happen. 1) replace local with rapid. 2) reduce local because of duplication of service, 3) cut rapid service in half because the buses are larger. And this is exactly what happened. I rode almost the entire length of the 704 for about 6 months(Silver Lake to Santa Monica), before I ditched it, not for driving but for cycling. It was mostly the evening ride back home that was the issue. I waited 45-60min for the bus once(this was before nextbus) and then it’d take an hour to get past the 405. I’ve gotten out and walked about a mile to get past the 405 and then got on another 704 for the rest of my journey home. I hung up my tap card and got a bicycle and now I do the same commute in less time and have lost 25lbs and am much happier. You think the 704 is bad try looking at some of the lines that run in the San Fernando Valley. 1 hour waits and lines that end at 6:00 pm. The Valley is exponentially undeserved compared to Los Angeles. Maybe in an ideal world you would introduce Rapid to a corridor without reducing the Local on the same route. But in a world of budget constraints, the Rapid is going to take some of the Local’s ridership, so it makes sense to pare back the Local a little. The bus size thing seems to be an independent issue to me. Since a huge portion of operating costs are labor, replacing 3 40′ bus trips with 2 60′ bus trips saves you a ton of money without really hurting capacity. The question is how much ridership you lose from going to longer headways. If it’s from 4 minutes to 6 minutes it’s probably not bad. If it’s from 20 minutes to 30 minutes, that’s a big problem. It is not great for riders, but if you’re doing cold budget calculus, it makes sense to use larger buses regardless of whether it’s a Local or a Rapid. I used to ride the 704 from West Hollywood to Santa Monica and back all the time, but after getting dumped off at Sepulveda a few times I now drive. I can tell you that back in 2004, the buses down Santa Monica at the Santa Monica & Westwood stop, there were 15 buses (4/304) between 5pm and 6pm weekdays. Now there are 10 (4/704) buses. In the morning there were 29 buses between 6am and 8am. Now there are 19. Even taking into account the larger 704 bus size, the actual number of “seats per hour” has gone down as well. And the transfer between Metro and SMBBB is made inexcusably more complicated than it ever has to be thanks to no joint fare policy for the region despite it having been 20 years since the Metrocard system was created and nearly 10 years since T.A.P. SFV rapid service is equally horrid. Lines 734, 741, 750, and 794 all run at 30-40 minute headways making it very unappealing to ride. Line 750 was one of the two original rapid lines and line 794 is the only rapid line to serve downtown. Meanwhile, MTA keeps flooding night service on rail – does the Gold Line really need ten minute service until midnight? Couldn’t 15 be enough? If they just widened headways to once every 15 minutes at night, not only could there be more money for bus service, but it also would result in fewer cancellations due to “maintenance” as is going on most weekday nights on the Red/Purple Lines. Much of this is historic, though… RTD never was a big fan of running frequent service at night, compared to other major cities. Your average frequency at 9 pm drops like a rock compared to places like Seattle, Denver, or even DC, when you have routes that run every 15 minutes during the day (76 on Valley, or the 81 on Figueroa) run hourly after 8 pm. But that has always been the case, and was exacerbated by the Consent Decree when MTA dumped buses during the peak hour to make up for reliability issues, but failed to invest in evening service. The madness of 704 Short Line is one of those things you look at and say to yourself only an idiot could come up with this mess. I’m another former 704 rider that has ditched it due to unreliable service. You aren’t kidding with this. It is REALLY bad. Metro’s response to this very busy corridor was to try and cut Line 704 service further by shorting it again on the Eastern end at Alvarado which mercifully they didn’t do. Not only this, but because the 704 stops at 8:00 p.m. and people use the #4 to get to night life, the #4 is packed like sardines late night, all through the night. There is no realization that just maybe, just maybe this transportation corridor operates somewhat differently than the other lines that have fewer riders late a night. Why aren’t there are articulated buses running all the way until the bars and nightclubs close? Since West Hollywood voted the largest percentage in favor of Measure R and since they aren’t planning Metrorail service anytime soon, how about throwing us a bone and giving us decent Line 4 / 704 service in our lifetimes? I even had a bus driver pull over and ask me the other night, “Is this Santa Monica Blvd.”? Ridiculous. Hi Dan, and thanks for your comment. As far as night service, I also attempted contacting MTA to add 60-foot articulated NABI’s to the late night “Owl” service to No. 4 (buses indeed are packed! ), but… to no avail. They still don’t get it. The idea of “one-seat rides” is just not justifiable as a matter of efficient urban public transportation. As long as transfers are organized and frequencies are high enough, one-seat rides be damned if transfers provide a better network. I’d agree on issues regarding total frequency on the corridor, but not on the need for a single bus line. Frankly, this argument remembers the Bus Riders Union and its asinine opposition to any reconfiguration of service, such as elimination of low-frequency circuitous routes, God forbids people change vehicles during their trips! Hi “andrelot” and thanks for your response. In general, I would agree with you – if we’re talking about an “efficient urban public transportation” system (quote from your comment). Which, as you know, isn’t the case with Los Angeles! What L.A. offers is long wait times for buses, and then forced transfers, which is not only cumbersome – to jump from a bus to a bus, but they require a bit of a walk (already adding unnecessary time), and then another loooong wait. This isn’t working for L.A. In addition, it’s ridiculous to cut a bus line and force a transfer on a SINGLE, STRAIGHT corridor, like Santa Monica Blvd. Especially when ridership has been great for decades. Again, I don’t mind transfers when you have an efficient, citywide subway system. Having traveled around the world, transfers were never a problem. But the L.A. system is completely different. Waiting for 15-20 minutes is bad enough, but when requiring to take another bus, and adding another transfer, all this creates pure inefficiency and enormous time waste. Hence you still see most Angelenos continue driving. Additional comments on this blog are a clear indicator of how service cuts, especially forced transfers, pushed away so many riders! As long as MTA continues with their lunatic decisions, bus ridership will continue dropping. posted stops can result in lawsuits. maintain. Artic’s having longer headway’s. plus for short lining is scheduled headway’s can be more easily maintained.